Say “climate change” and see how most people react. I find it’s a bit like “sustainable development”: a phrase at which many people quietly glaze over and switch off. So here’s the first point: Don’t switch off. Climate change isn’t just words. It is a real Thing. And man-made climate change is a very scary real thing. The rise in global temperature over the last several decades is a matter of public record. There is an overwhelming scientific consensus that it can only be explained by one thing: the rise in greenhouse gas emissions caused by human activities. Some people say that climate change is natural and we shouldn’t worry. The answer to that is that we have indeed had naturally-occurring climate change since the Earth was formed. But none of the natural causes of climate variation, from the Sun’s output, the tilt of the Earth, volcanic activity or emissions from rotting vegetation, can account for the warming we observe today. There is only one thing that can: the emissions from fossil fuels caused by human activities over the last two hundred years. The concentrations of carbon dioxide in our atmosphere have increased by nearly 30% since the beginning of the industrial revolution. Here’s another inconvenient truth. Not only is global warming happening, it may be speeding up. The 20 warmest years on record have all come since 1995. The five warmest years have all been in this decade, the 2010s. 2016 was the hottest year since records began. And this year the UK had the joint hottest summer on record. It was extremely dry too – the driest across England since 1921. The Environment Agency’s hydrologists recorded exceptionally low river flows for five weeks in a row, reservoir stocks were at historic lows and soils in the North West were the driest on record. The environment suffered badly: numerous species, habitats, birds, trees and aquatic life were affected by the hot conditions and high demand for water. The Environment Agency responded to a 330% increase in drought-related incidents as our teams acted to protect wildlife and rescue fish struggling due to low river flows and low oxygen. This kind of thing won’t happen every year. But it will happen more frequently, and it will happen worse. Most of us enjoyed this summer’s exceptional weather. But by 2040 it is likely there won’t be anything exceptional about summers like the one we have just had. The records will keep tumbling. Exceptional may be the new normal. And just as the rate of temperature rise looks to be accelerating, so too does one of its main consequences: the rise in sea level. Over the last 20 years sea levels have risen at roughly twice the speed of the preceding 80 years. It gets worse. While the international community has pledged to avoid a rise of more than 2°C in the average global temperature by 2100 compared with pre-industrial levels, many scientists think that the figure will be higher. The central scientific estimate now is that by 2100 global temperature will have risen by nearly twice the 2 degree figure - by around 3.5 °C. Second big point, and one that bears constant repetition: if we don’t tackle climate change, very bad things will happen. • The higher latitudes, where the UK sits, will be hotter and wetter. • In Britain we will have hotter summers. By 2040, we expect more than half of our summers to exceed 2003 temperatures. • We will have wetter winters, and extreme rainfall events will become even more extreme. This is already happening. In 2015’s Storm Desmond, a gauge at Honister Pass in Cumbria recorded 341mm of rain in 24 hours, a new record: that rain caused some of the worst flooding in living memory. Last year’s flash floods at the Cornish coastal village of Coverack were caused by an extreme rainfall event which set a new UK record for 3-hour rainfall intensity. Half a mile offshore the rainfall intensity was 25% higher. It was only a fortuitous accident of nature that it didn’t make landfall. • Sea levels will rise significantly, perhaps by up to a metre in places by 2100, as waters warm and take up more space and our glaciers and land-based ice sheets melt. Sea level rise is particularly scary, because while other climate change-driven effects like extreme flooding or drought can do terrible harm, recovery from them is possible. But there is no recovery from a rising sea: it takes land, communities, infrastructure and everything else away forever. More frequent and more extreme flooding and coastal erosion, caused by those wetter winters, heavier rain, stronger storms and rising sea levels. That threatens all of us, because floods destroy: lives, livelihoods, communities. • More water shortages and higher drought risk, caused by the hotter drier summers and less predictable rainfall. That could do deep damage to our economy and our environment. • More frequent and more extreme fires and wildfires, such as we saw in the UK and around the world this summer, often with terrible human cost. • More air and water pollution, due to those longer, hotter summers. That will threaten the living world of plants and animals, our wider environment and our own health. • More damage to wildlife and the habitat on which it depends. In many cases that damage may be existential. If we continue to emit greenhouse gases at the same rate as today, then by 2050 one million species across the globe are likely to vanish. We in this country are particularly exposed to these effects. The UK sits at a weather crossroads, with a big water mass to the west, a large land mass to the south and the jet stream running over the top. Our location means we will experience more of this extreme weather than some others. So don’t get comfortable. If we allow climate change to continue unchecked, England’s green and pleasant land will be neither green nor pleasant. And if sea levels rise significantly, there won’t be much of our land left either . Example: Lincolnshire. Much of that beautiful county is flat and low-lying. Quite a lot of it is a tidal floodplain. It is already at significant flood risk. 43 people lost their lives there in the great 1953 flood when a huge storm surge brought the sea crashing through the coastal defences. That’s why the Environment Agency has spent hundreds of millions of pounds improving and maintaining Lincolnshire’s sea walls and other coastal defences. And it’s worked: in 2013 there was a bigger East Coast storm surge than the one sixty years previously – and nobody died. But as sea levels rise and the storms get fiercer, how much higher can we build the walls around our coasts? There’s a limit to what’s practical and affordable. And even if we build ever higher and stronger defences along the coastline, there’s another problem: our rivers. Climate change means more rain is likely to fall more quickly into our rivers. So they will fill up quicker, and will flood the surrounding land unless they can rapidly discharge all that rainwater into the sea. But the higher tides and sea levels which climate change will also bring mean that precisely when we need our rivers to be better at discharging water to the sea, they will be less and less able to do so, because they will be increasingly tide-locked. So we could have three nightmare future scenarios: one where high seas overwhelm our sea defences, a second where the rivers flood the land behind the defences, and a third – the worst of all – where both of these things happen together. The result, if we fail to address these future risks, will be that many low lying parts of the country will be either permanently waterlogged, or flooded with such frequency as to be no longer habitable. In my Lincolnshire example, Skegness would be lost, Lincoln would be at the edge of a new wet fenland landscape, and much of the rest of the county would revert to marsh. That’s enough bad news. The good news is that it doesn’t have to be like this. We can tackle this problem, if we act now. Because while some of the effects of climate change - temperatures increasing, sea levels rising, wetter winters, more violent weather – will continue for the next 30-40 years no matter what we do now, we can affect what happens after that. We know what we need to do. It’s summed up by another two words that tend to make people switch off but which also really matter: mitigation and adaptation. Mitigation means addressing the causes of climate change, by reducing or stopping the human activities which are affecting the climate system, for example by cutting our emissions of greenhouse gases. Most of the UK’s emissions come from the way we produce and consume energy – from heating our buildings, driving our cars, manufacturing goods, watching our TVs or boiling our kettles. We can lower our emissions by becoming more energy efficient and switching to renewable or low-carbon fuels. As a country we’ve made a good start on that. UK emissions are down 43% compared to 1990, while over the same period the economy has grown significantly. That’s really important: it shows that we can both tackle climate change and grow our economy. But most of these emission reductions have come from closing coal power stations and cleaning up heavy industry. That was the easy bit. It’s a lot harder to reduce emissions from transport, agriculture and buildings. That will require much greater use of renewable energy, and infrastructure to capture and store remaining carbon emissions. The quicker we can move ahead on all that the better. Adaptation means making changes to prepare for, reduce and negate the effects of climate change, for example by building stronger sea defences to reduce the vulnerability of coastal communities. Other things we can and should be doing now include reducing water usage by cutting leakage and extending domestic metering; avoiding any unnecessary development in flood plains or on fast-eroding coastlines; and designing infrastructure that will be resilient to the more extreme weather we know is coming. There’s more good news. There is now a pretty broad consensus – at least in this country - on the need to do these things. The government gets it. You can see that in the 25 Year Environment Plan launched this year by the Prime Minister and Michael Gove, which commits the government to take all possible action to mitigate climate change, including by continuing to cut greenhouse gas emissions; to adapt to reduce the impact of climate change; and to ensure that all government policies and investment decisions take it into account. 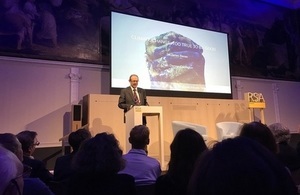 You can see that in the National Adaptation Programme issued by Defra in July, which sets out the actions the government will take over the next five years to help the country adapt to climate change; and which recognises that while we should continue to aim to keep global temperature rise well below 2° C, our resilience will only be robust if we prepare for worse scenarios. And you can see it in the government’s new National Planning Policy Framework, which is explicit that all new development plans should “take a proactive approach to mitigating and adapting to climate change, taking into account the long-term implications for flood risk, coastal change, water supply, biodiversity and landscapes, and the risk of overheating from rising temperatures”. The independent experts get it. The National Infrastructure Commission has recommended a national standard of flood protection for all communities to be achieved by 2050, a concept which the Environment Agency supports; and major investment to enhance water supply and reduce demand in order to tackle the long term drought risk which climate change threatens. We support that too. The Green Finance Taskforce, composed of leading experts in academia, finance and civil society, has identified ways to encourage capital to move towards greener and cleaner sectors in the UK; and rightly framed this not as a cost but as a huge opportunity for investment, in particular in those sectors which are the backbone of the economy such as housing, transport, retail, utilities and industry. Business increasingly gets it. The insurance companies are pricing climate change into their policies and looking to help their customers become more resilient to its effects, not least because that can cut insurance payouts when things like flooding happen. The water companies, energy companies, retail sector and others see the hard-nosed business sense in investing now for resilience later. All businesses need to be able to sustain their operations in a climate changed world, and to have confidence that when extreme weather hits, they will be the first back up and running. The NGOs get it. Many of them, not just the environmental NGOs, are recognising that climate change poses the biggest threat to the things they and their members want to achieve, and are rightly challenging the rest of us to go further and faster in tackling it. And - I hope you will agree - the Environment Agency itself gets it. As regulators, we work every day with industry and the energy sector to reduce their greenhouse gas emissions. We are working with local authorities, planners and developers to create better places, designed for the climate we now anticipate. We are working with the water companies to manage the short term consequences of drought, as we have been doing this summer, and to ensure that the country will have better water security in the long term: last week I launched a new collaborative initiative with the leaders of the water industry to do precisely that. We are building new flood defences up and down the country, explicitly designed for climate resilience. We are thinking long term about those defences. We design them with the latest climate change predictions in mind. And we build extra strong foundations beneath many of them so we can raise them as sea level and river flows rise. And despite their long design lives, we are already working on a replacement for many of them. The Thames Barrier, which protects 125 square kilometres of central London, millions of people, and £200 billion worth of assets, is designed to sustain that protection against a changing climate till around 2070. But we are already planning its successor. I like to think of projects like the next Thames Barrier as the modern version of the great age of cathedral building. We will develop the plans and lay the foundations, and future generations will lift the spire. The Environment Agency’s philosophy is that we should aim to do better than just surviving a changing climate: our aspiration is to help the country thrive in it. We can do that by working with the grain of the natural environment. Example: the Medmerry flood defence scheme on the Sussex Coast. Instead of building an unsightly wall to protect the local community from rising seas we knocked a large hole in the shoreline to let the sea in so as to create a large new area of coastal wetland. That wetland is the flood defence: it absorbs the high tides safely. But it is also a new and beautiful wildlife habitat, now run by the RSBP as a bird sanctuary. It’s a great example of how you can turn the threat of climate change into an opportunity to create a better place. We in the Environment Agency are also trying to walk the walk ourselves. We are reducing the carbon footprint from our own day to day operations year on year. Our £3bn Pension Fund is a leader in green finance. We have embedded climate risk into our pension investment strategy for well over a decade and have delivered outperformance. Together with the Church of England’s investing bodies we founded the Transition Pathway Initiative, with the Paris climate goals at its heart. The TPI assesses how companies are preparing for the transition to a low-carbon economy and is supported by asset managers and owners with over £7 trillion of assets under management. And at Governor Brown’s Global Climate Action Summit earlier this month, it was announced that TPI’s insight will inform Climate Action 100+, a global investor initiative to engage with companies to drive climate action, supported by $31 trillion assets under management. Perhaps more important still, the British public increasingly get it. More and more of the people I meet up and down the country tell me that they are seeing evidence of climate change happening in front of their eyes. Many of them then go on to say that all of us as individuals have a duty to what we can to tackle it. Don’t underestimate the power of the people. We’ve seen an almost overnight change in behaviour in relation to plastics. We’re seeing something similar, if slower, in people’s attitude to water, with more and more of us taking care to use it wisely. It has become socially unacceptable to litter or to use throwaway plastic bags. It is increasingly socially unacceptable to waste water. The same thing can happen – and maybe is happening – with regard to behaviour which stokes climate change. One last bit of good news: while it will cost a lot of money to respond successfully to climate change, we can afford it. Indeed, it’s the best investment we could possibly make. It would be much more expensive not to respond. And the economic benefits of mitigating and adapting to climate change – in terms of damage foregone, extra growth achieved through new investment and infrastructure, prosperity boosted through innovative technology - far outweigh the costs. The scandal is not that climate change is made up. The scandal is that it’s not, and that while a lot is already being done to tackle it, we are still not doing all we could. Why is tackling changing climate not at the top of everyone’s agenda? Partly, no doubt, because most people have busy lives and other things to worry about. Partly because the effects of a changing climate tend to be invisible and incremental until they are suddenly catastrophic. And maybe too because of the words we use. Language matters. So here’s a final thought: if words like “climate change” and “global warming” have become a turn-off for most ordinary people, maybe we should change the words. Perhaps we should talk instead about what those things actually mean: killer weather, a world under water, and a mortgaged future. Many people might not get out of bed to fight something that sounds vaguely technical and non-threatening called climate change. But pretty much all of us would do so to protect our loved ones, our homes and our livelihoods, and to build a better world. Conclusion: climate change is too true to be good. So let’s tell it like it is, let’s tackle it together, and let’s redouble our efforts. Over the last two hundred years humans have comprehensively demonstrated that they can change the climate – and we have changed it for the worse by doing the wrong things. Now let’s show we can change it for the better by doing the right things.